Niantic, the makers of Pokemon GO have decided that it would be in their best interest to support Autism Speaks in Arizona. They are promoting this on their social media channels and will have a kids zone with various activities at the walk. I have a strong hunch that it is their PR Company, TriplePoint behind the tweets and support. We are trying to let them know that they are, essentially, ignoring autistic voices–the very same autistic voices that benefit from, you guessed it, POKEMON GO! They are ignoring us. They refuse and fail to respond to our valid criticism. As a whole, the #actuallyautistic community is outraged with very good reason. The big question looming is “How have they failed to do research?”. They, of all people/companies should know how to use google before they make a failed attempt at educating themselves on causes they choose to support. It turns out that @NianticLabs is providing a *full event space* for the Autism Speaks Walk in Arizona. We hear and appreciate all the feedback, as well as the other recommendations for Autism organizations that you’d love to see supported, so please continue to share some of the organizations you’re close to. This is only applicable if you plan of cutting your ties to autism speaks and supporting a charity that is favourable by the #actuallyautistic communities standards. Otherwise, your actions will continue to hurt us and we deserve to be heard. You have been silent long enough. Please let Niantic know that even though @SARRC_tweet is who they are supporting, it’s still benefitting autism speaks. …But apparently, they do not listen! This whole thing is laughable at best. I was interviewed by a local, community newspaper under the umbrella of black press media. The reporter was incredibly interested in my art, autism and my story. I specifically told her about my disapproval of Autism Speaks and how their aim is to eradicate autistic individuals like myself. I told her how important this detail was in regards to my own journey. Every so often, I find myself looking up the title of the article to see where it’s been posted. To my surprise, a disgustingly sick feeling came over me, It has been posted on the Autism Speaks facebook page for all to see. The goal, Wosk explained, is to help people become more educated about autism — that’s why she spends much of her online time being an activist for autistic people and protesting against organizations like Autism Speaks, which Wosk said spend more time looking to eliminate autism rather than support autistic people. It had been up for 2 hours with over 40 likes and 2 shares. 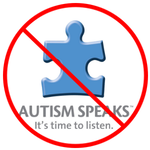 I don’t think any of those Autism Speaks supporters (or even Autism Speaks themselves) even bothered to read my article, because if they did, they wouldn’t have posted anything with an unfavorable mention. This begs the even larger question of the importance of autistic opinions. I believe that when it all comes down to it, it’s that money rules and we don’t matter. This was certainly not my first online encounter with this greedy “charity”. Nope. Autism Speaks Canada actually e-mailed me once trying to tell me all the things they do. TELLING me is important to note because they failed to read or even address anything I had said. Autism Speaks wants to replace and eliminate us. Our voices are not worthy or important to them. When I realized that Autism Speaks slogan was “It’s time to listen”, my heart sank. I honestly felt like I broke in to a thousand little pieces that no one could pick up. It was the feeling of grief. The more I research, the more I realize how much Autistic voices matter. The CEO of Autism Speaks is someone who has experience managing different health related foundations. Her name is Angela Geiger. As far as I can tell – She is NOT Autistic. Autism Speaks Canada is headed up by Jill Farber and she has spent 15 years as a private consultant specializing in ABA. She is NOT Autistic. It’s important for the verbal portion of the Autism community to speak up for not only us but for our nonverbal brothers and sisters. After all, we know best. This is who we are in every aspect of our being. Wouldn’t it be nice for Autism Meetup groups and self-advocacy networks to have funding and get provided devices and tools to make life easier? Frustratingly enough, most companies need a “front” to do so. By that I mean a “charitable” organization with whom to “partner” with so it looks like they’re doing a DAMN amazing thing to benefit those who need it most. Why can’t they do it without the publicity or without a partnership? Money- simply put! Advertising is key. Looking good to those who are uneducated on the subject increases profit margins and a veil of “doing good”. I’m not really here to knock the amazing work different foundations do (not all of them). I just find it quite curious how voices continue to be silenced. I feel like there’s so many Autistic advocates who would be very interested in the opportunity to be heard by a room full of people who can make a change by donating funds. I am aware that companies do this because, for the most part, it makes THEM look good. Recently, a local Autism Centre had a lavish winter fundraiser with plenty of large companies and corporations who were quite pleased to contribute monitarily. I was on twitter when my feed was absolutely bombarded with images of the event. My Boyfriend reminded me this was a BUSINESS FUNCTION and of course they are going to exclude Autistic individuals and that it’s more of a PR event. I have been doing my very best to get the word out because I believe that people who are Autistic can contribute their voice to these kind of issues. When I found out about this event while it was happening I quickly sprang in to action. Not only did I write each and every company that contributed, but I also wrote the board of directors for the Autism Centre that hosted the event. I did get one response which said I could BUY A TICKET for the event or I could become an “advocate” for this centre by making a $15 donation. Seems kind of backwards. Please, Include us. Consider us as very knowledgeable advisors. Listen.